A stay at Villa Gardenia will make you feel like you’re a world away from the stress of everyday life. Lush gardens surround every inch of the home, and the pool overlooks a gorgeous ocean view. 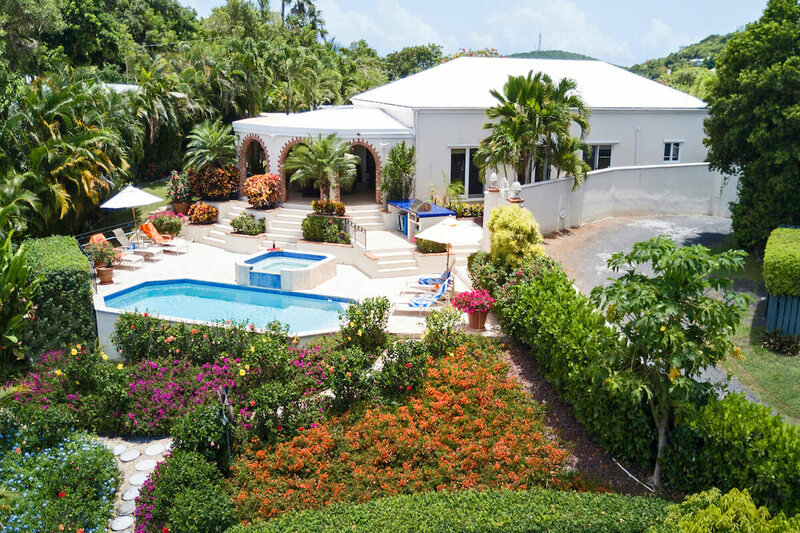 You may not venture any further than the terrace, but Villa Gardenia is also just a few minutes away from Magens Bay Beach and Charlotte Amalie’s shops and restaurants. Villa Gardenia combines vintage and modern design to create a warm, relaxing getaway. The villa is in a peaceful cul-de-sac in a residential area, and is surrounded by a 6-foot high concrete wall. This villa certainly lives up to its name, as there are lush, vibrant gardens all around the property. The courtyard holds a bubbling fountain and a Koi pond, and the veranda offers a relaxing place to take in the view. The tiled pool and hot tub are just below the Great Room, and they’re surrounded by a lounging terrace overlooking the sea. Above the terrace, there’s an outdoor bar with a built-in gas grill and an 8-top dining table. A stone archway leads into the home’s open-air foyer and common area. The air-conditioned, spacious Great Room provides a place to gather for conversation or watch BluRay DVDs on the flatscreen TV. A Bose sound system, Sonos, and Amazon Echo are placed throughout the interior. The dining room and well-equipped kitchen sit nearby, and French doors open to the gardens. Villa Gardenia’s gourmet kitchen features marble countertops along three sides, bar stools along one side, and a 5-burner gas range, two ovens, and a microwave in the center. There’s also a powder room and a home office with a fax machine, laptop, and WiFi. The laundry room and wine cooler are just off the kitchen, and the interior is fully air-conditioned. All three suites are located off the Great Room. The king suite features a Select Comfort Sleep Number bed and an ensuite bathroom with marble, a raised tub, and a roomy shower. This suite also has its own cedar-lined walk-in closet and access to the covered terrace. The second suite has a queen bed, a sofa bed, and an ensuite bathroom with a tub and shower. The third suite has a king bed and an equal ensuite bathroom. Magens Bay and Mandahl Bay are both nearby, and there are several restaurants in the area. Nature lovers can check out Magen’s Bay Park and Coral World Ocean Park, which are equidistant from Villa Gardenia. Rates do not include: tax of 12.5%, island charges of $650. Magen's Bay beach is a 7 - 10 minute drive from Gardenia Villa.